Stamp a Sweet Impression: Our Friday Friend is Back! Our Friday Friend is Back! With the holidays and all the CHA excitement SASI took a little break from the regular feature of Our Friday Friend, but we're back and in a big way! Please welcome the incredibly talented Dawn Easton (TreasureOiler on SCS). Dawn is a Stampin' Up! Demonstrator and you probably know her work as a Dirty Dozen Alumni on SCS. Please visit her SCS gallery as well as her blog Treasure Oiler Designz. 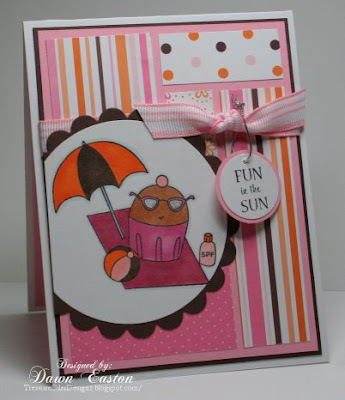 Dawn created a sweet and sunny card to share with you today featuring the SASI set A Year of Sweets 2. I live in Edmonton, Alberta, Canada with my husband Brian and our daugher Chloe. When my daughter started kindergarten I was looking for something to keep me busy as I was a stay at home mom. Volunteer work takes up a great deal of my time but I really wanted something for me too! I met another mom at the school who was a SU! demo and she invited me over to stamp. I had no idea what she was meaning but hey...I was game. Well it's been 4.5 years now and I've never looked back!! I think I fall more and more in love with this hobby everyday!! Rarely does a day go by that I haven't made a little something. I always giggle when someone asks about my style. I've never really given it much thought. Clean and crisp cards have been a favourite of mine. Designer papers used to frighten me but now I can't seem to make many cards without them. I do like a lot of layers on my cards and they tend to be a little bulky and heavy. As for favourite projects, I'm more of a card person but I do enjoy altering items too. I wish I could scrapbook and maybe someday I'll dabble a little more in that. A favourite....oh gosh....I can't say just one. Sorry! They are all so adorable, not to mention fun to colour! In a 9 x 13 pan spread the angel food cake pieces and mandarin oranges. In a seperate bowl, mix the jello and water and add the orange sherbet until it melts. Refrigerate until it starts to set up. Then mix in the cool whip. Pour that entire mixture over the cake and mandarin oranges. Refrigerate. Thanks Dawn for that yummy treat idea and for being Our Friday Friend! No contest to enter for this. Today is the last day to enter the current Top Chef contest to win a Taylored Expressions stamp set from the upcoming release on March 5th. Click here for all the details! Just gorgeous, Dawn! LOVE your card! Congrats Dawn! Super Cute Card! Love your creations! ADORABLE card, Dawn! !...ahhh, I can just feel the warmth after seeing your bright and cheery card. CONGRATULATIONS on being our Friday Friend! ...oh, and feel free to send me ANY chocolate that you don't like, LOL! Your card is so cute, Dawn!! I love the fun colors, and your fab layout! Congrats on being the OFF!! Your card is adorable, Dawn!!! Your coloring is FABO, as always, and I love that cupppies suntan!!! Congrats on being the Friday Friend!!! Super cute card Dawn! Love the summery colors and the great lay-out. TFS!